There are many different leadership styles, but if you want to facilitate innovation and creativity in your organization the most important trait to have as a leader is positivity. It sounds simple enough, however, in today’s fast changing business world positive leadership often has to take a backseat to ‘hard goals’. The job of project managers is quite demanding: projects are getting larger and more complex, time constraints are getting tighter, there is more competition and so on. So it is understandable that in stressful and high pressure times, it is hard to stay positive and focus on the human aspect of PM. However, a project manager not only needs hard skills, but also has to have soft skills in order to stimulate creative and innovative thinking and as a result lead the company to success. Startups and new businesses are often full of passion and creativity, however, these aspects often lose importance as the company grows. Slowly, everyone is only working towards more efficiency disregarding everything else. This can be quite dangerous, because people are only working on making existing processes and ideas more efficient and forget that the world around them keeps moving forward. With that kind of thinking, a company won’t last for long (e.g. Kodak). If you want your business to grow and move forward, you need to consider implementing a positive leadership style. 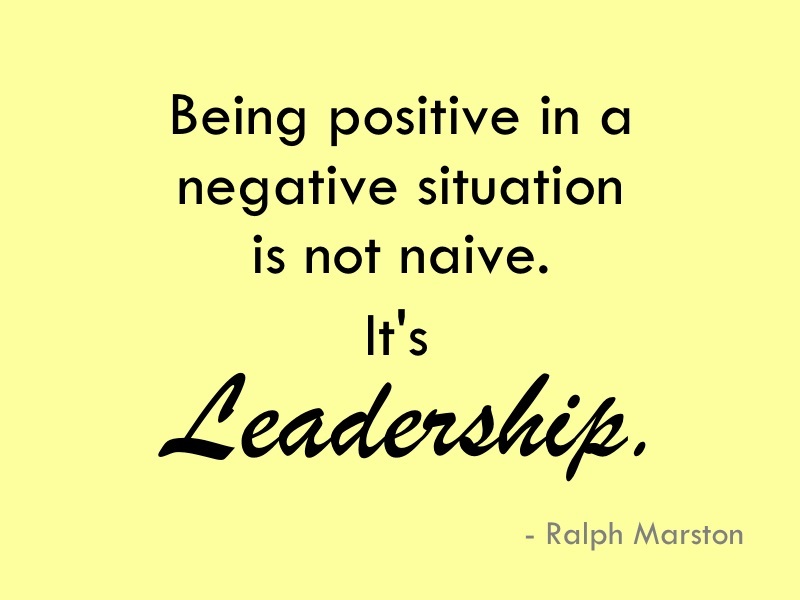 How to be a more positive leader? Well, this is kind of obvious, but it doesn’t hurt to reiterate the importance of having a positive attitude. You can start by choosing your vocabulary consciously. Instead of saying “this won’t work”, you should say “let’s make this work”. Or as Bob the Builder would say: “Can we fix it?” – “Yes we can!”. Replacing negative words with positive ones will help you keep a positive outlook. The same goes for delivering negative messages, if you do it with a positive attitude people will be more accepting of it. As a leader it is also important to be present. This doesn’t mean that you should hover above your team and breathe down their necks constantly, but show them that you are always available to listen to their concerns. A simple “hello” in the morning can also go a long way. Next to being a good listener, you should also ask a lot of questions. Interact and communicate with your team, be inquisitive and don’t be afraid to ask tough questions. But also be open to suggestions and comments. Even the most motivated and creative person will not be able to flourish if you don’t show them that their creativity is being appreciated and is of value to the organization. This can start with the work environment: a small room without windows probably won’t be conductive to creativity. Neither is a mere emphasis on making processes more efficient. You have to show your team that creativity and new ideas, no matter how outlandish, are welcome. A positive leader should also put an emphasis on collaboration. We often hear stories about the ‘genius founder’, e.g. Bill Gates, Steve Jobs, Mark Zuckerberg etc., so it often seems as if they did everything themselves. However, all these men worked with other people to create their now multi-billion dollar businesses. Fun fact: collaboration is a very important aspect of the company culture of these organizations. This is also a very important aspect of positive leadership: don’t micromanage. Give your team members the freedom to structure their work load and work as they see fit. Nothing hinders creativity and innovation more than tight rules and regulations. 3M is famous for its policy to allow employees to use 15% of their time to pursue whatever project they want to. And this strategy really paid off for the firm in regards to innovation. Failure in and of itself is not a bad thing. It’s all about how you deal with it. You shouldn’t actively encourage failure, but you should convey to your team that it is OK to fail. Many very successful entrepreneurs have failed many times before they succeeded. How? By using the experience they have gained through failing and turn it into a learning curve and doing better next time. As a leader you should always strive for continuous improvement. Everything, every product and service can be improved, no matter how well it might work at the moment. You should also motivate your team to follow this mindset. It’s not about reinventing the wheel, but more about doing better than you did before, even if it’s just a small change. In fact, the Kaizen philosophy emphasizes exactly that: improve constantly by making small, continuous changes. The most important thing you have to do if you want to be a positive leader is to show appreciation. In our recent Work-Life-Balance survey, we found out that employees feel that a lack of appreciation from supervisors can cause more stress than a high work load or time constraints. As a leader you need to give recognition where it is due. A simple “well done” can motivate and encourage your team immensely. Positive Leadership, Innovation and Creativity in Projects - InLoox • Copyright 1999-2019 © InLoox, Inc. All rights reserved.